Today was a very productive day. In addition to serving at the ministry and hosting "On the Box," I spent some time with Ray and Anita distributing "180" DVDs and talking to students at Cerritos College. This afternoon I was joined by my sister, her family, and some of her friends to distribute "180" DVDs outside of Canyon High School, in Canyon Country. I had a little less than an hour before dinner. I wanted to get out with the cross to keep with my personal commitment and goal to be out with the cross as close to every day as possible. So, I picked a quiet corner close to home--the corner of Tournament Road and Golf Course Road. As I stood quietly on the corner, I noticed my shadow in the street. The image of my shadow holding the cross was almost eerie, ominous. I must have stared at my shadow for more than a minute. When I returned my gaze to the motorists who, one after another, stopped at the stop sign, I watched each driver. Some people smiled. Some snickered. Some rolled their eyes and shook their head. Some did everything they could not to look in my direction. And still others were simply indifferent to my presence. As I watched the people drive to the intersection, stop, and drive away I began to have thoughts I have never before experienced while carrying the cross. And my heart grew more heavy by the moment. I thought of how many thousands of people in my community have seen the "Are You Ready?" cross. About fifty intersections over more than 2 1/2 years--the number of people must be in the thousands, maybe tens of thousands. And then I asked myself a difficult, even painful question. How many people who have seen the "Are You Ready?" cross are now dead? And how many of those who have died, without ever coming to repentance and faith in Jesus Christ, had as one of their last thoughts the afternoon they saw a man standing on the corner, carrying a cross. Carrying a cross is not evangelism. Posing the question "Are You Ready?" by writing it on a wooden cross is not evangelism. Asking someone if they are ready is not proclaiming the gospel. Carrying a cross is pre-evangelism. As the stories on this blog and elsewhere well attest, the Lord can and does use the "Are You Ready?" cross to create opportunities for sharing the gospel. That being said, I found myself wondering as I stood on the corner if God might use the "Are You Ready?" cross as a reminder or warning of what will later be the outpouring of His wrath and judgment, upon the lives of some. Of course, I do not know if God has used, is using, or will use the "Are You Cross?" for this purpose. And I will never know this side of Heaven. But just the thought of God using the cross in that way, for that purpose, added a weighty, sober feeling to carrying the cross. I found myself fighting back tears and breathing a tad bit deeper as I contemplated the new burden I carried. Not that carrying the cross is burdensome (it's a privilege and joy); but an increased sense of burden for the loss and how important the foolish act of carrying a cross just might be. 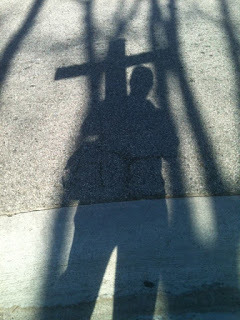 My cross just got heavier--not by the pound, but with the weight of the unexpected way the Lord may be using it.